The streaming video pioneer has given long-time investors big gains. Successful companies adapt to changing times, and few companies have reinvented themselves as thoroughly as Netflix (NASDAQ:NFLX). The company started out by being the most efficient at delivering DVDs by mail to satisfy the viewing needs of its subscribers, but when video streaming over the internet made it unnecessary for people to have physical media in order to view content, Netflix made sure that it became the first-mover in that category as well. Let's take a look at how Netflix stock has performed throughout its history and whether the company is poised for even more gains in the future. As you can see in the chart above, Netflix has had a strong stock history. Its gains since its 2002 IPO amount to about 8,000%, meaning that for every $1,000 you originally invested, you'd have $81,000 now. A closer look reveals four distinct periods during which the stock put in its best performance. In late 2003 and early 2004, Netflix shares responded positively to the company's success in dominating the DVD-by-mail space. At the time, Netflix was a pioneer of mail-delivered video content, and the fact that it offered unlimited rentals without late fees distinguished it from competitors like Blockbuster Video. The gains prompted Netflix to do its first-ever stock split in early 2004. After that, the next big run-up for Netflix came in 2010 and 2011. By then, the company had switched its focus to video streaming, working hard at lining up content to deliver directly to subscribers. Yet early on in the video-streaming industry, it was hard for companies to get the rights to new movies and television shows in a timely fashion, because dying corner-store rental outlets were still hoping to survive by at least retaining their corner on the new-release market. Once Netflix started lining up contracts with major content producers, the writing was on the wall for traditional video retail locations, and Netflix soared from there. Yet in late 2011, Netflix shares suffered huge losses, and some corporate mistakes were largely to blame. The company said in July that it would increase pricing for its DVD plans substantially, upsetting its traditional customers. Then, in September, CEO Reed Hastings said that he would break Netflix into two separate companies. One, dubbed Qwikster, would concentrate on DVDs, while the continuing Netflix would concentrate solely on streaming video. Shareholders responded negatively to the resulting subscriber revolt, and only a month later, Netflix backed off its breakup idea and tried to regain customer trust. It only took a couple of years for Netflix to get its stock price back to all-time highs. After having developed its domestic market extensively, the video streamer started setting its sights on its potential for international expansion, and investors reacted favorably to the idea that the Netflix model could extend into a worldwide franchise. The costs of expanding overseas held back immediate growth prospects for earnings, but shareholders seemed content at the idea that revenue gains would signal the eventual success of Netflix's international business. The last big jump for Netflix stock took place in 2015. The company had demonstrated its ability to wield its pricing power to boost subscription prices while still retaining most of its customer base. Meanwhile, the success of Netflix-produced shows, along with the ongoing expansion of its content library overall, had helped the company continue to boost its subscriber counts. With subscriber additions internationally having started to outpace domestic growth, the next phase of Netflix's growth had helped get shareholders even more excited about its prospects. Where does Netflix go from here? More recently, 2016 has been a tough year for Netflix stock. Guidance for subscriber growth hasn't lived up to past expectations, and competition from the likes of Amazon's Prime Video offering has seemed to gain more credibility as a real long-term threat to Netflix. Fears about studios holding out on licensing content to Netflix have also picked up steam in the eyes of analysts. Yet time and time again, Netflix has been able to defy negative forecasts and find new ways to bolster growth. With its increasingly strong bargaining position with movie studios and television production companies, Netflix can count on being able to negotiate lucrative deals to deliver the content that its subscribers want to see. The video streamer can also expect that when it needs to raise prices, it will be able to do so without massive customer defections. 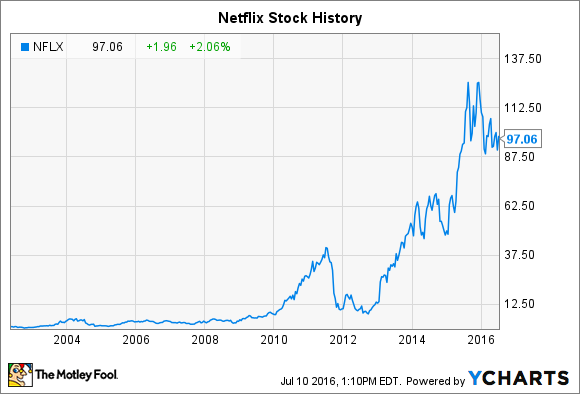 Netflix stock has been extremely successful over time. Despite its recent doldrums, the share price has the prospect of continuing to deliver superior returns to shareholders over the long run.